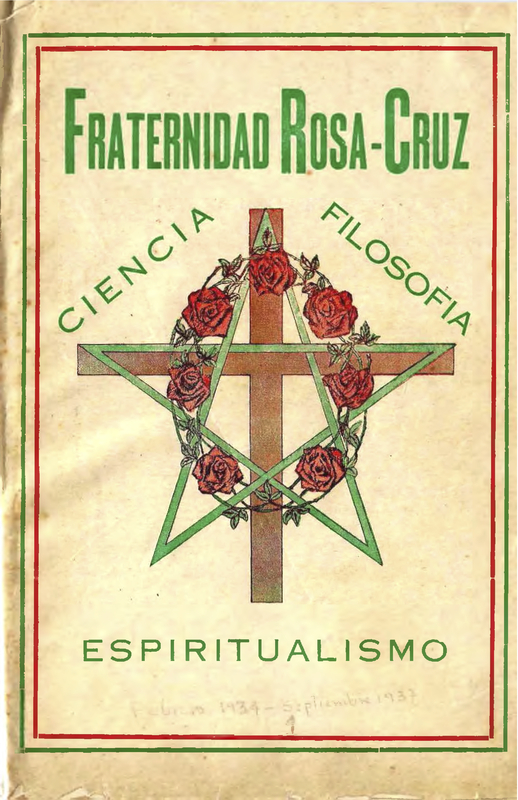 Revista de Ciencia Rosa-Cruz y Estudios Afines / Luz del Mundo. 1/1, February 1934-current. 16 pp. With 5/7, April 1940, the journal added “de Oro” to its title. This was the organ of the Rosa-Cruz de Oro/Fraternitas Rosicruciana Antigua, part of the labyrinthine genealogy of Theodor Reuss' O.T.O. The group was founded by Arnoldo Krumm-Heller ("Huiracocha") in Colombia in 1928 and directed by Israel Rojas ("Raghozini," "Joselin," 1901-1985) for more than 50 years, through massive transformations, internecine battles, and the appearance of various competing messianic figures like Om Cherenzi Lind and Samael Aun Weor. The journal combined Krumm-Heller's Rosicrucianism with Gnosticism, spiritualism, health food, kabbalah, Theosophy, yoga, the works of Swami Vivekananda, Prentice Mulford, Franz Hartmann, Eliphas Levi, Rudolf Steiner, W.W. Atkinson (thought by Krumm-Heller to have been St. Paul in a previous incarnation), and Max Heindel, and other streams of occultism, all of which were subsumed under Krumm-Heller’s key notion of the sublimation of the "psychogenetic" energy—i.e., sexual energy—in accordance with cosmic vibrations. For a time Rojas abandoned Krumm-Heller for the wiles of Cherenzi Lind, whose articles and advertisements graced the journal. See the note under Ariel. Krumm-Heller responded by calling Cherenzi Lind "a black tantric magician," and Cherenzi Lind returned the compliment by saying that Krumm-Heller was part of a Nazi propaganda bureau in Spain. Both parties had some truth in their allegations. Rojas also started and edited Union Espiritualista America, 1946, perhaps as a replacement for this journal during one of its numerous gaps in publication. An almost complete run of the journal is at fraternidadrosacruzdecolombia.com.